24 November 2010, at 12:58a.m. UK - New technology to remove micro-organisms from the most crucial areas of poultry production is being introduced by Food Chain Innovation and Air Scientifics. 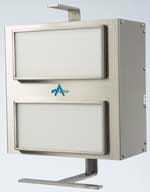 The Close Coupled Field Technology (CCFT) technology adopted in equipment from Air Scientifics uses a controlled high-voltage field to destroy airborne viruses, bacteria and fungi. The equipment is totally safe and provides continuous protection so that, unlike traditional methods of ozone generation, ultra-violet light and fogging, there is no need to evacuate areas during cleaning. "We have tested equipment in egg stores, vaccine preparation rooms and transfer/candling areas with excellent results," says Allan Meldrum, director of Food Chain Innovation, who are working with Air Scientifics to introduce this technology to the poultry industry. "In contained areas such as vaccine preparation room, we have been able to remove 98 per cent of the background microbiological flora. In egg stores, we have shown a 50 per cent reduction in the surface swab counts, illustrating how much of the egg surface contamination is airborne"
During hatchery trials different types of equipment have been used according to the type of environment and room size. The equipment is designed and manufactured in the UK with a range from standard 'plug and play' units to customised equipment designed to work with existing air handling systems. "We have been very pleased with the results, which show just how much can be achieved in improving egg and chick quality by air cleaning," says Mr Meldrum. Working with hatcheries in the UK, the team has been able to develop solutions for different hatcheries areas, farms and for specific applications such as in-ovo vaccination. "We are currently working on a couple of exciting hatchery projects and beyond that into logistics. Our aim is to protect the entire food chain and in reality the possibilities for this technology are enormous," added Mr Meldrum. For more information, click here for Food Chain Innovation or Air Scientifics.